There have been many developments in the past few years when it comes to smartphones, be it faster storage or improved optics or blazing fast processors. However, what many would like to see is some innovation on the battery front. Having a powerful smartphone with a battery which gets us through a day’s usage with ease still looks like a far-fetched dream, which is why we have to rely on fast charging solutions. Well, one such fast charging tech has been unveiled today by Meizu at MWC which is called Super mCharge. Meizu’s Super mCharge technology can charge a smartphone with 3000 mAh battery in under 20 minutes. Well, that’s fast. To pull this off, Meizu relies on an 11V/5A charger which outputs 55W of power. While some fast charging solutions heat up the battery, and in turn the smartphone, Meizu’s Super mCharge manages to restrict the batery temperature at 38-degree Celsius with a room temperature of 22-degree Celsius. “Super mCharge adopts optimized charge pump technology. Comprising two groups of circuits, charge pump exports half of the voltage after transformation and improves efficiency by 9%. Our solution yields 98% efficiency, compared with other companies who struggle to hit 90%.” says Meizu. 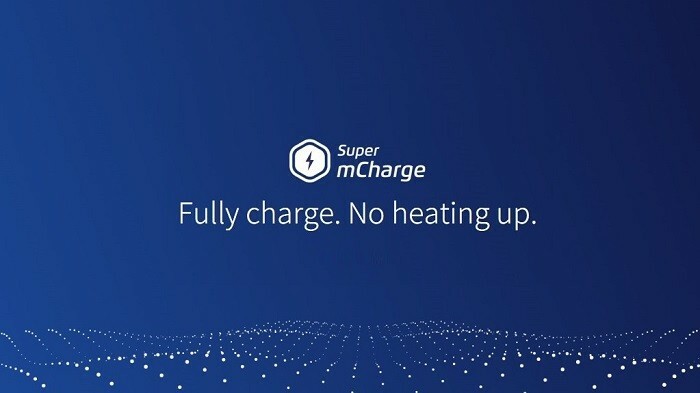 “Super mCharge is safer and more secure. Only half of the electric current is needed to reach the same power, and its innovative and efficient structure reduces heat generated problems.” the company further added. While this surely looks impressive, a special data cable is needed to deliver the charge, and hence, Meizu has redesigned their data cable which is capable of carrying up to 160W of power. This is way more than the 55W of power transferred to fully charge the 3000 mAh battery under 20 minutes. Furthermore, Meizu stated that in their testing, the battery was able to retain over 80% capacity after 800 complete cycles of charging and discharging. For now, Meizu hasn’t revealed when this technology will make it to its smartphones, but whenever it does, it will be worth checking out.